Allstate lost nearly half a percentage point of market share in 2017 to end the year as the country’s No. 4 insurer, according to data released last week by the National Association of Insurance Commissioners. Progressive overtook it to command 9.88 percent of the U.S. private passenger auto market and the No. 3 slot, up 0.71 percentage points from 2016. Allstate fell 0.43 points to control 9.29 percent of the industry. State Farm remained No. 1 at 18.13 percent, down 0.17 points, while GEICO rose nearly an entire percentage point (0.91) to close the year at 12.83 percent and the silver medal. Other notable losers include Farmers (down 0.32 points) and Nationwide (down 0.39 points), though both held their No. 7 and 8 slots with 4.49 percent and 3.18 percent of the market, respectively. The Hartford lost 0.17 points and fell three slots to end the year at No. 18 with an even 1 percent market share. Besides GEICO and Progressive, notable winners included No. 5 USAA, up 0.24 points to a 5.7 percent share. Auto-Owners rose 0.13 points to climb three slots to No. 15, swapping places with the Hartford and controlling 1.09 percent of the market. 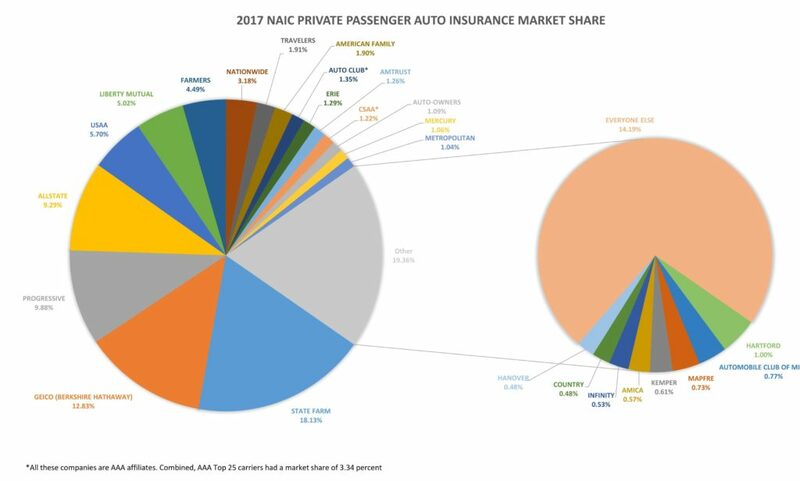 Insurance industry consolidation also continued, with the Top 25 carriers controlling 85.82 percent of premiums at the end of 2016, up from 85.15 percent in 2016. The Top 10 insurers held 72.33 percent of the market, up more than half a percentage point from the prior year. Allstate brand President Matt Winter said on a February fourth-quarter 2017 earnings call that the frequency decline registered by Allstate was consistent across risk segments, customer tenure, rating plan, geography and accident type. He said the insurance industry as a whole experienced a similar decline — but Allstate has outpaced the industry by at least 1.5 points on property damage for all four quarters of 2017. 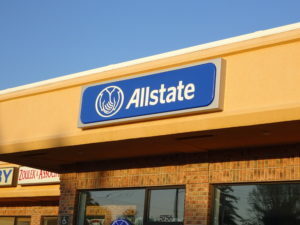 Winter in February indicated that Allstate’s reduction was in part fueled by its “segmented rate” increases in response to the frequency spike between late 2014 and early 2016. The carrier targeted riskier segments — i.e. customers who were likely going to be worse drivers crashing more frequently — with higher premiums. “That increased defection rates of those underperforming segments,” he said. The carrier’s rate increases also reduced new business (which tends to have a higher loss ratio), according to Winter. This willingness to trade volume for profitability can perhaps be seen to some degree in the NAIC data. The proportion of premium dollars Allstate paid out on specific auto claims and the cost containment and defense efforts related to them in 2017 was lower than any of the other Top 25 carriers. Allstate only spent 62.3 cents on every premium dollar — around $13.3 billion of the $21.3 billion it made in auto premiums — in what had previously been called Allocated Loss Adjustment Expenses. This doesn’t include other overhead such as staff adjusters or advertising, however; on the whole, Allstate wants to post an underlying combined ratio of between 86 and 88 in 2018 (i.e., $0.86-$0.88 of every premium $1), a metric that includes everything except catastrophic losses and reserve re-estimates. The highest ratio was AAA affiliate Auto Club of Michigan, at 105.39. Next was USAA with 82.2. From a shop perspective, the market share data provides a few resources. One is a means of educating customers about the idea that their insurer might be making money off of premiums prior to reinvesting the “float” — and therefore have no grounds to seek to capture more profit by arbitrarily denying estimate line items. Direct repair program shops and shops considering joining a DRP also benefit from the perspective on how much work might be coming or not coming in 2018 from a particular carrier. Finally, the standings also offer an industrywide perspective on which insurers a shop is likely to see more or less of in 2018 — and perhaps how worried they might be about losing customers.